Recommended Screening Guidelines - WHAT IS SAS? SATB2-associated syndrome (SAS) can affect multiple organs/systems. 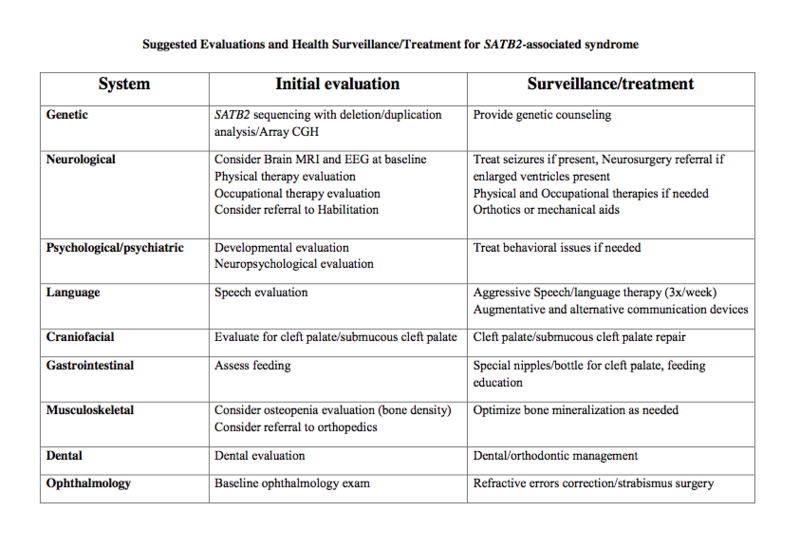 Dr. Zarate suggests a comprehensive evaluation of multiple systems with the corresponding surveillance/treatments. These recommendations are based on the current published information available as well as knowledge of several other unpublished cases. Have in mind that these recommendations have not been systematically studied on a large group of patients. A table of recommendations can be found below (Manuscript under review). Perhaps the most frequently asked question about SAS is about future speech development and what else could be done. It should all start by a comprehensive neurodevelopmental evaluation at diagnosis. Given the high frequency of abnormalities of the central nervous system, Dr. Zarate suggests a brain MRI as part of the evaluation process to determine if there are anomalies that could require neurosurgical care (such as enlarged ventricles). Similarly, it is important to document and treat seizures. Of note, EEG abnormalities appear to be more commonly documented even in the absence of clinical seizures. A parent of one of Dr. Zarate’s patients enrolled in his study (with a deletion) reported that her daughter was found to have a very abnormal EEG at 20 months (See Meet Sylvia). The EEG abnormalities persisted and by 3.5 years of age she was started on antiepileptic management (Keppra) despite not having documented clinical seizures at any point in her life. After a few months of treatment, her mother reported that her memory, concentration, and speech showed improvement. Another patient enrolled in Dr. Zarate’s study (with a deletion) is perhaps the most verbal (250+ words at age 5) of those with SAS. Her mother mentioned that in addition to intense dedication at home, she had started Prompts for Restructuring Oral Muscular Phonetic Targets (PROMPT) and speech therapy at 2 years of age. Between school and private sessions, she was getting 6-8 speech sessions a week with great speech improvement over time. Equally, augmentative and alternative communication devices such as Picture Exchange Communication System (PECS) and Ipads were used with some success. Further, the same child was introduced to American Sign Language early on and had learned over 700 by 5 years of age. Her story is well documented in her blog: satb2associatedsyndrome.blogspot.com.